Once they are triaged, we can apply the repair to them. In the case of the pockets, we repair them literally by over-stitching, making a new pattern along to the top of the pocket. After reselling, the second step for the circular economy of denim is repair. What is exciting about this is that in the end our customers love the value of an item that has had an artistic repair. 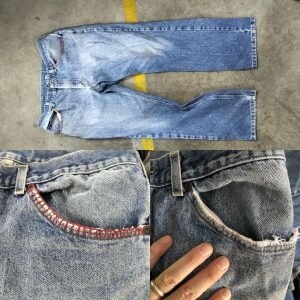 Curious about repairing denim at scale? Check this video out. Buyers in Pakistan are requesting new and established salvage items that present a new revenue opportunity for thrift store suppliers. The demand includes: Decorative Pillows, Linens, Kitchenware Metal, Backpacks, and Single Shoes. The financial team must determine that revenue will offset labor, material, transportation and storage costs and provide an acceptable return. In order to provide the necessary volume, a thrift operation will need on average six (6) stores to pull salvage from and process at a single warehouse. Training to meet the industry sorting guidelines will need to be implemented. Standards of quality and packaging must be monitored. Information for planning, implementing and selling new categories is available at 866.613.0719 ext. 189. Being one of the largest traders in used apparel in North America, and operator of the largest commercial remanufacturing facility in the world, Bank & Vogue aims to resell, then repair, and remake. Now, we are excited to be closing the loop with an innovative project in partnership with Swedish chemical recycling company re:newcell, that will turn post-consumer denim into a new, recycled fiber at industrial scale. In this project, the precious material in 90,000 pairs of jeans can now be recovered and made into clothes once again, saving massive amounts of CO2, freshwater and chemicals.